Please tell us a little bit about who is the person behind Chakra? Chakra: Well, my name is Rami R. Shapira, a simple and nice guy that loves life, and is very much into fusing imagination and technology with music. I have been producing music since my childhood. How did you start producing music and when did you discover trance? Chakra: I started producing music professionally and performing in the end of the 80s. In those times in Israel there were few people that were producing electronic music and there was one club in Tel Aviv that was promoting it ("The Penguin"- very underground). The music was E.B.M (electronic body music), for those that don’t know the style, it's something like trance but has this 80s new wave industrial feel. Then in the beginning of the 90s in my quest for new frontiers of electronic music, as electronic music evolved, I began my first trance project under the name Witchcraft with Itzik Levy (Sandman), whom I met through a mutual friend, and we were signed to a major label in Israel (Hed Arzi- Headroom), and were joined by Yoad Nevo as our producer/sound engineer. (He later worked with Sugababes, Air, Goldfrapp, Pet Shop Boys, Youth and many more). After some releases as Witchcraft, I started my own project under the name Chakra and released some tracks in compilations in different labels. You’re name is on one of the biggest classics of the trance culture- Chakra & Edi Mis - The Promised Land -please tell us a little on how this album was born? Did you imagine when you made it the impact it will have? 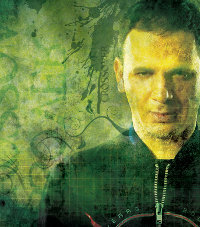 Chakra: Well, in 1995/6 I teamed up with a friend DJ/producer Edi Mis, that I knew from the 80s electronic club scene in Tel Aviv, to do some experimental fun music. We did a first track together (Final Mission) and we loved the outcome and the fun we had working on it, and we decided to do another one (X-File) with the same fun-no-boundaries feeling and then find a label to release it. We had a good feeling about these tracks and enjoyed working on them. We didn’t imagine an impact or anything else as it was just for pure fun experimental music. We tested it in clubs and outdoor parties and we saw that there was a huge reaction everywhere, we realized that we created a new style of trance music, and decided to go for a full length album that will include these two collaboration tracks and other solo tracks from each of us. And album that will have a nice ride and story board. Then we teamed up and signed with a sub label of Hed Arzi- Musica Plus (Krembo) to release The Promised Land album. Then after a world wide tour, playing at all major festivals and clubs, MTV appearances, remixes by famous artists and getting into UK Dance chart, we realized that we invented something new and a classic that will influence new generations and stay in the hearts of people for a long time. Can you tell us a little about the first days of the trance movement? What was it like? Do you have good memories? Chakra: The trance movement in the early years was pure underground. It was the best times in my point of view and I have very good memories of that time, as it had this innocent feel of something new and we truly believed that we’re making a difference and yes we made it recognizable (legit). Especially in Israel where the system didn’t accept this sub culture we felt like we had to fight for our right to have it recognized… and I guess we did it for us and for future generations to come. Are you still in touch with people you’ve worked with and released some real classics with in the past, like Edi Mis, Sandman, Liquid Metal? Chakra: Yes sure, I'm in touch with the guys. Edi Mis is living in San Francisco so I hardly see him, Sandman is around, and as for Liquid Metal we are still good friends. Along the way you started your own label- Optimus- and was actually the first to bring and release progressive and minimal trance in Israel with artists such as Son Kite, Ticon, 3.Turn & Guy Gerber- all who became very famous afterwards. You have release excellent 12” and two excellent compilations, however, Optimus didn’t succeed and you closed it. What went wrong? The music was excellent, so why didn’t it work out? Chakra: Well, Optimus just wasn’t profitable business-wise at that time, it was more for fun and to promote a different style of music that I liked, and at that time (1999-2002) I wanted to release techno and progressive music because I really liked it. Also I wanted to co-produce new talented Israeli artists because not a lot of people knew this kind of music in Israel. After a couple of years I had enough of it, as it was too much time consuming and I decided to get back to the artist seat. It took you a very long time (13 years) to release your second album- Crossover- that came out not long a go with Hommega- why so long? Chakra: Well, as you know I had Optimus till 2002 and I produced other artists, then I decided that I want to teach new generations what I know and started to lecture at colleges in Israel as I still do these days too. I decided to make a new album in 2005, as I first thought about making only an EP with Hommega, that should have been released in 2004/5 but at the end I decided to go for a full album and I didn’t want to rush with it. I wanted the album to be colorful and not standard. The process wasn’t short as you know and I wanted to have different and unique sound and have other producers participated with me in it. So it took time. Tell us about Crossover- what can we find there? 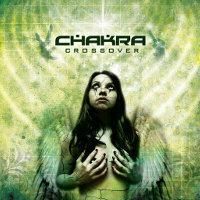 Chakra: In Crossover there’s a whole range of tracks that is a snapshot of what I have been through in the last years. Also there are some new remixes of my classics, and participation in production by producers like John '00' Fleming, Yahel, Xerox & Illumination, Black & White, Krunch, Insomnia and Audio Junkies, as I wanted Crossover to be colorful and unique. I think there’s something in it for everyone and I think there's a good ride in it as a whole album. You collaborate with quite a few people on the album and have collaborated a lot in the past- do you like working with others and why? For me there is an unmistakable Chakra sound that I can always identify. What is the Chakra sound? Can you give us the main ingredients/sounds/production techniques that make Chakra what it is? Tell us about your live act and how it developed along the years since the early live band shows with Tsuyoshi as a drummer? Chakra: Chakra live act is today is as it was in the early days and trough the years. Only the musicians changed. Chakra Crossover 2009/10 tour consists of me as usual on the keyboards, machines and vocals, a killer drummer girl- Mai, and a killer guitar player-Jessy Bullet. An album, song, producer, DJ that made a change for you lately? Chakra: The new albums from the great veterans Depech Mode and Prodigy just reassured me that the famous saying is true- Old is Gold! Any last messages, links, wisdom to share? Chakra: In process now and Coming soon 2009 -Juno reactor – Tanta Pena (Chakra remix) official. Choose your music, don’t go with the flow, experiment and have fun! Chakra Myspace site for updates and upgrades. Chakra site underconstruction will be online till end of this year- www.chakra-music.com.